Previous post: Doing twitter well! Next post: Notorious Meg joins the laviators club! 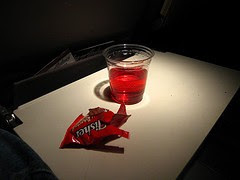 Recently Patricia Aspinall, of Travel Savvy Mom, wrote an interesting article about her experience on board a flight to the Caribbean with a passenger who had a nut allergy, while traveling with her husband and daughter, a two and a half year-old. Like my own two year-old, Patricia’s daughter is a picky eater, so Patricia did what any smart mom would do and packed snacks – peanut butter granola bars. Solutions? Unfortunately, there’s just one solution – no nuts! Regardless of picky eaters on board. Not to sound harsh, but I’d rather have a hungry child on my plane than a plane that has to divert because someone has a serious allergy attack. A recent study showed that nearly one in 10 people with peanut, tree nut or seed allergies experienced an allergic reaction while traveling on an airplane. Surprisingly, most of these reactions occurred as a result on inhaling airborne particles from peanuts. This occurred after multiple bags of peanuts were opened near a person with peanut allergy. Airborne peanut particles seem to be common on airplanes, since peanut proteins have been found in the ventilation filters of commercial airplanes. Because we no longer serve free food on board the airplanes, nuts are always a popular snack with passengers and crew alike. They’re healthy and filling and fit easily inside a tote bag. My favorite, almonds and pistachios. My coworker last week shared a bag of cashews. People bring nuts and products containing nuts on board all the time. So what happened when a child with a nut allergy walked on board my mother’s flight two years ago?